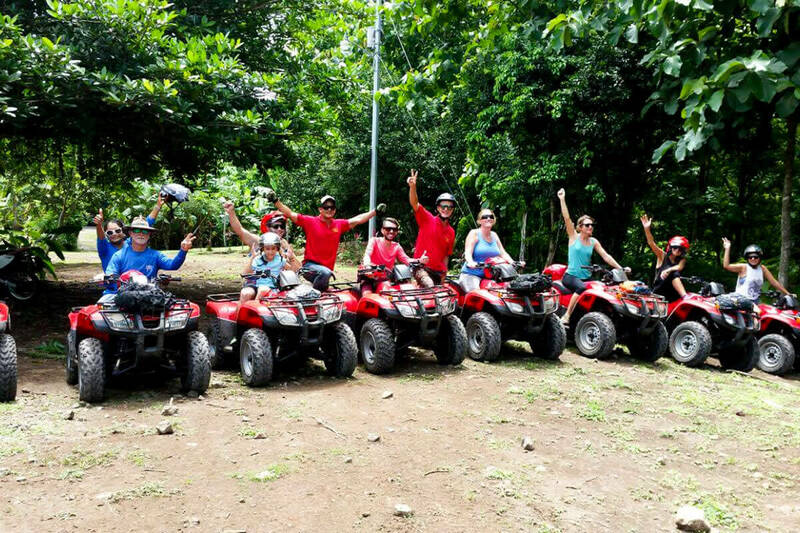 Experience the most unforgettable ATV tour in the Quepos/Manuel Antonio area, located just minutes north of the Manuel Antonio National Park biological corridor. 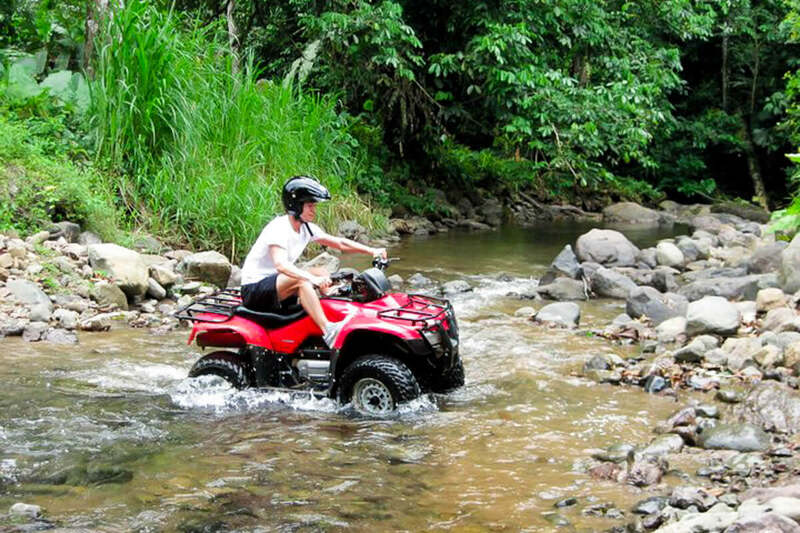 After hearing our safety & security instructions, drive your own fully-equipped ATV into the rugged mountains, where your professional bilingual guides lead you through rustic tropical settings, we drive from San Antonio de Damas to see waterfalls and natural springs located in the unique rain forest ecosystem. During the tour we pass by several different types of plantations: teak, rice, papaya and African palm. Your guide will point out interesting facts concerning the environment. We also pass through several traditional Costa Rican towns; this gives you the chance to see a different more rustic side of Costa Rica. 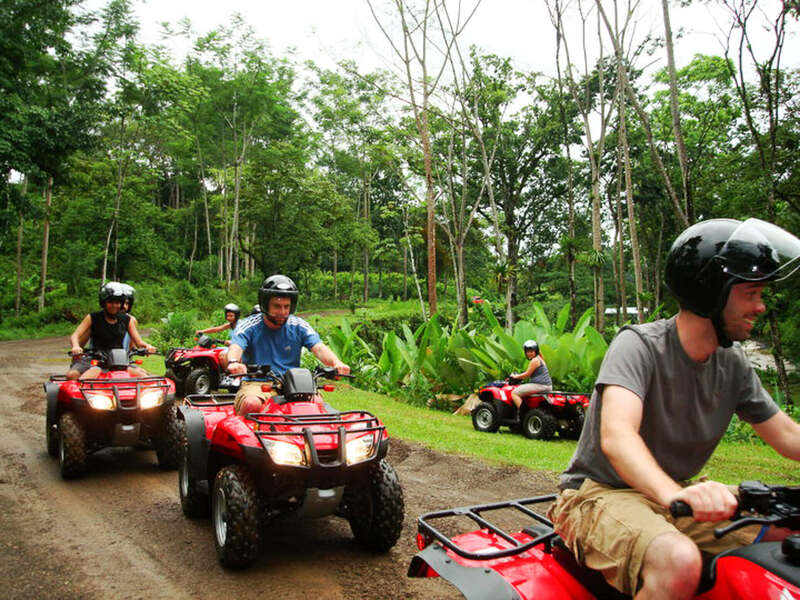 About half way through your journey, you will leave your ATVs on the trail for a short nature hike through the primary rain forest, With a little bit of luck on our adventure tour we will see: Titi Monkeys, Toucans, Sloths, various types of tropical birds. Then reward yourself by indulging in a breathtaking waterfall, where you can swim in refreshing, crystalline waters. End your exotic journey with a delicious Tico-style meal at our private Ranch. 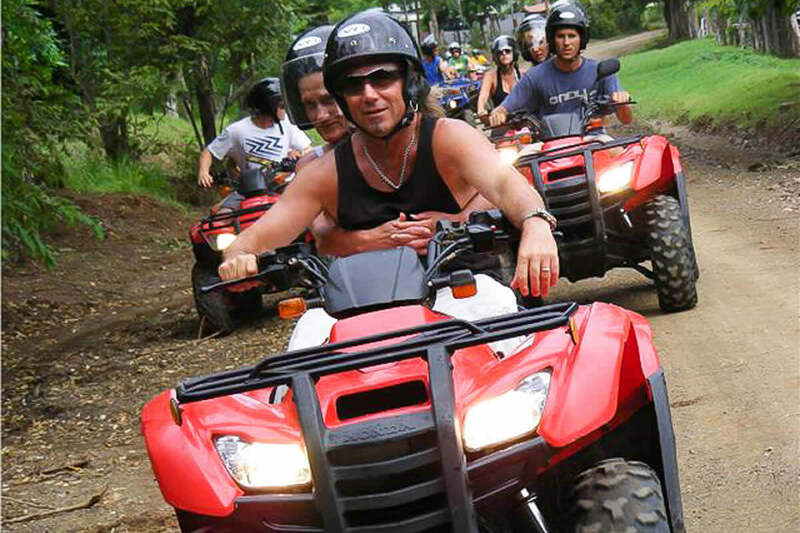 Overall, this is a Costa Rican adventure not to be missed! 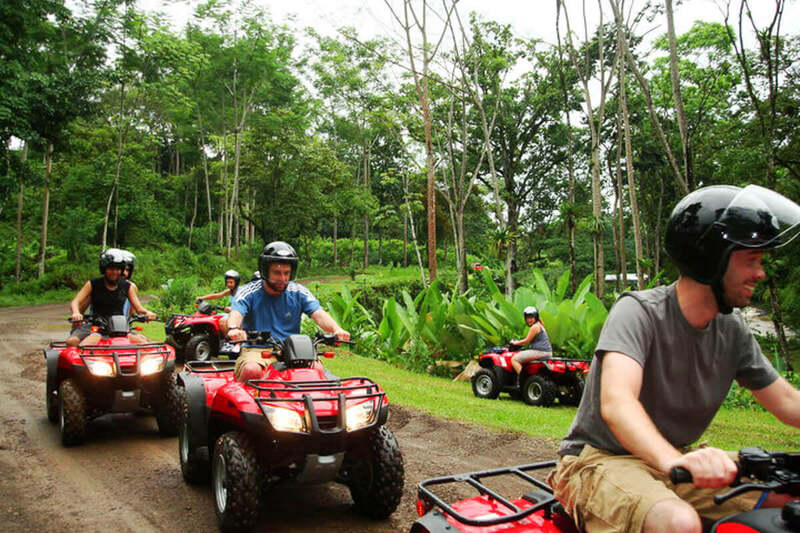 The four-hour tour begins with a pick-up from your hotel in Manuel Antonio and a short drive outside town through the African palm orchards to the FourTrax adventure center. 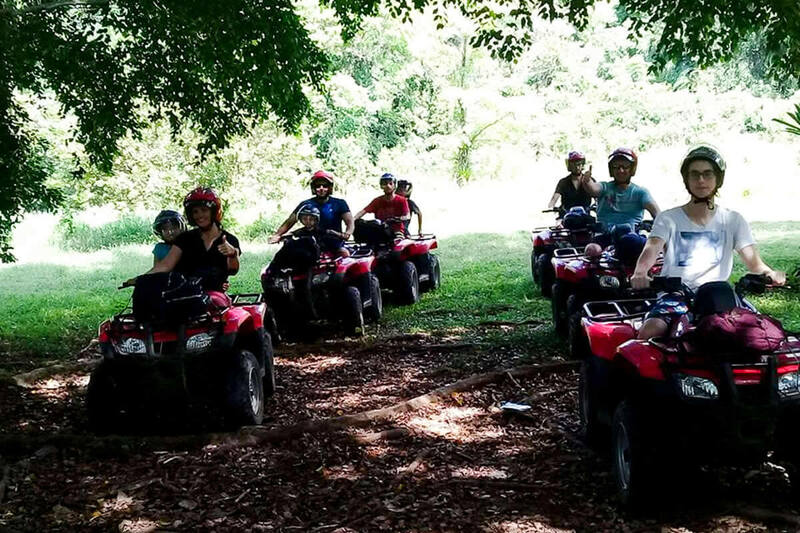 There, you'll get acquainted with one of 14 semi-automatic ATVs: learn how to operate it and give it a test drive before heading off for an adventure through the palm orchard. The 12-mile journey will take you through the dirt roads of the local Costa Rican villages of San Rafael and La Parcela. Through sodden trails, winding switch backs and muddy streams of an African palm orchard, part of a 135,000 acre farm that grows African palm fruit for the production of palm oil. 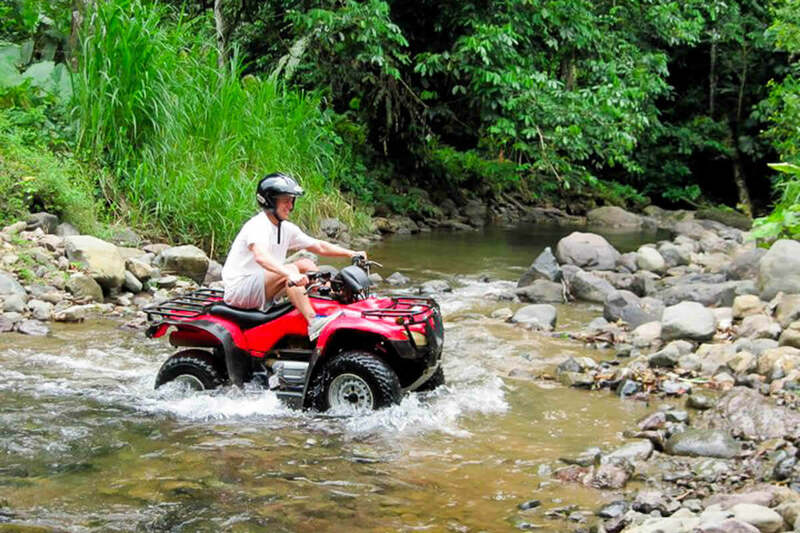 Ride all the way to the Fila Chonta Rainforest Reserve where you'll disembark your ATV for a mile-long hike into a secondary rainforest. Trek through the forest along hillsides and over bridges above streams on your way to visit a 150-foot waterfall and a natural pool; a refreshing place for a swim in cool spring-fed water. 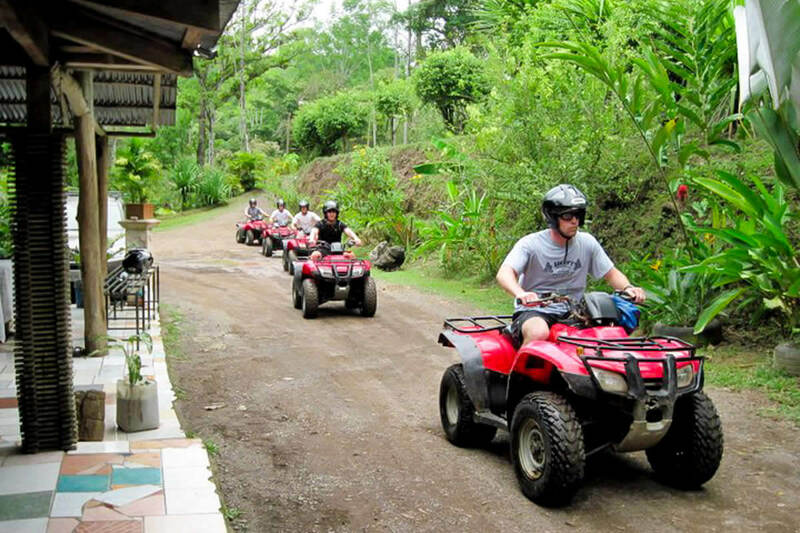 Afterwards, you'll hike back to your ATV and head back through the palms to the adventure center where your journey began. A traditional Costa Rican meal of rice, beans, vegetables and chicken is waiting for you by the time you clean up. 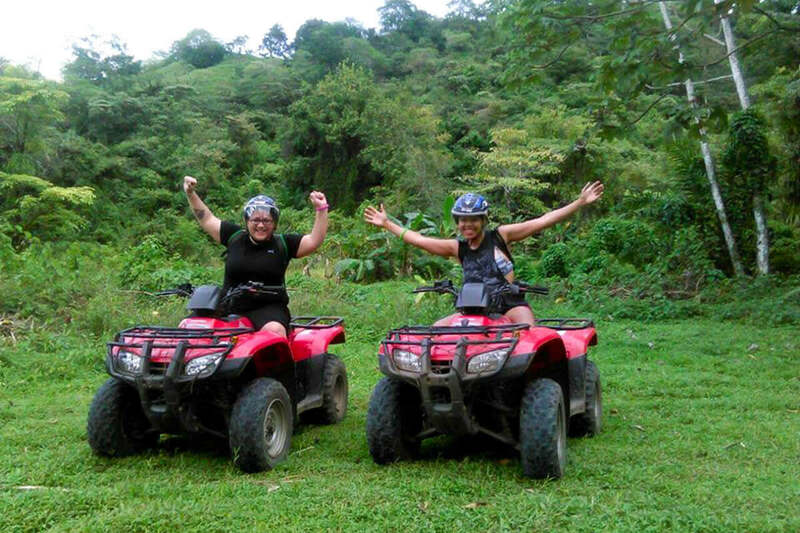 Exhausted, full and still reeling from the adrenaline of your ATV ride, you'll jump in a shuttle for transport back to your hotel in Manuel Antonio. 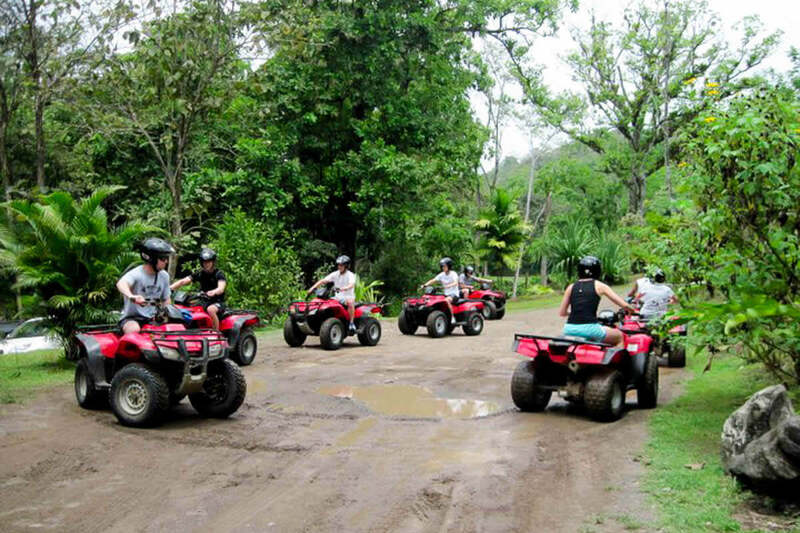 The tour includes: Transportation, ATVs HONDA fully equipped, safety helmets, bilingual guides, refreshments & meal, round-trip transportation, 12-mile ride through African palm orchard, naturae hike through a beautifull rainforest reserve, swim in a natural pool with waterfalls, contarican traditional meal and drinks. 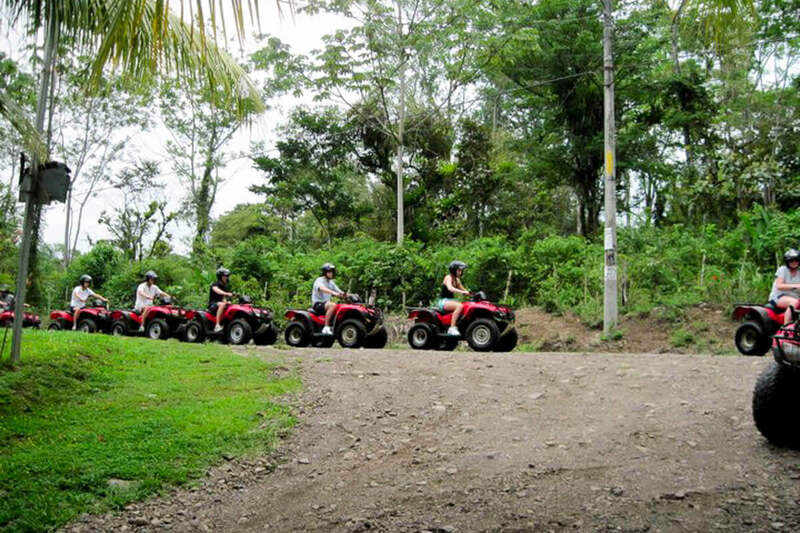 US $110 per person (1 person on 1 ATV) with transportation and a meal. 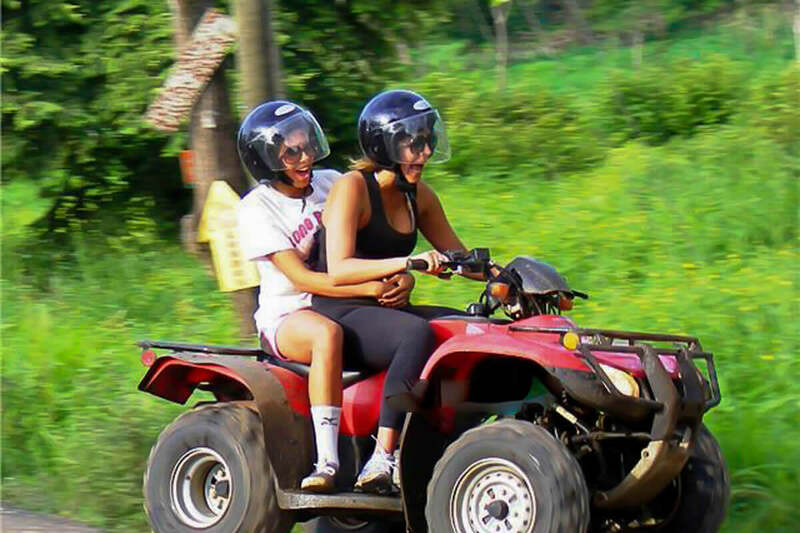 US $70 per person (2 persons on 1 ATV) with transportation and meal. 7:00am, 10:30am and 2:00pm (According the location of your hotel. Transportation is included only from Quepos and Manuel Antonio around). Comfortable clothing, bathing suit and towel, sneakers, insect repellent, sun block and camera (waterproof) and change of clothes is optional.